Spray 3-quart saucepan with cooking spray. Cook onions, gingerroot, red pepper and garlic in saucepan over medium heat 3 to 5 minutes, stirring occasionally, until onions are tender. Stir in 5 cups of the broth, the lentils, turmeric and salt. Heat to boiling; reduce heat. Cover and simmer 25 to 30 minutes, adding remaining broth if needed, until lentils are tender. Stir in tomato, coconut and mint. Serve over rice and with yogurt. 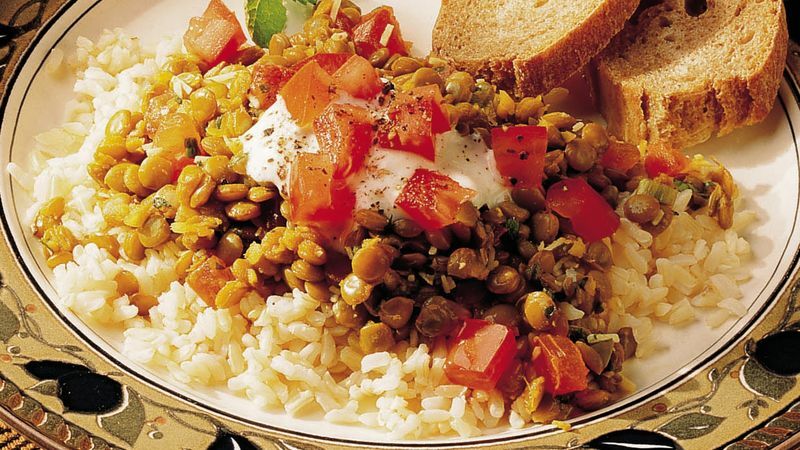 The term dal (or dahl) is a spicy East Indian dish often made with lentils. In India, dal also refers to many varieties of pulses (the dried seeds of legumes) that include beans, peas and lentils. Love those lentils because they are a good source of iron and phosphorus, as well as vitamins A and B and calcium.